How did it happen? You were being so good about eating healthy - now you're face to face with a whole coconut cream pie or a burger and fries from the nearest fast food joint. A sudden craving, a time crunch or a lengthy dinner menu can bring one on - diet disasters happen. What can you do when faced with a situation that seems almost guaranteed to knock you off the healthy eating track? Here are solutions to the most common diet disasters. Potential Disaster: I always wind up eating the whole bag of snacks - but my family will riot if I stop buying them. Solution: You don't have to eat the whole bag. But chances are you will - or you will eat more than you planned on - if you eat out of that big bag. Even if it's a low fat, low carb or otherwise healthy snack, the calories will add up. The solution, however, is easy. As soon as you get home with that bag of chips, puffs or other snack, look at the Nutrition Facts to see how many servings are in that bag. Then take the same number of sealable sandwich baggies and divide the snacks evenly into each one. So next time you want something to munch on, just grab one of those single serving baggies! Potential Disaster: I've just got to have a piece of cake/ pie/ pastry/ other high caloric indulgence. Solution: Okay, so you can't get your mind off that yummy looking apple pie or double chocolate layer cake - so have it. We all need a treat now and again. But be smart about it. Don't go to the market and get a whole cake or a package containing a half dozen pastries. Go to a coffee shop or bakery, order one piece to go and take it home. And don't eat it out of the Styrofoam container - set it on a plate and eat it with a real fork, not the plastic one they stuffed in the bag. In fact, if you've got good china, use that. An indulgence should be a special occasion, something you do rarely, and it should be treated in a special way. Really enjoy that piece of cake or pastry - savor it. Eat lightly for the rest of the day to make up for the extra load of calories. Enjoy the moment and go back to your usual, healthy way of eating as soon as you're done. Potential Disaster: I'm on the road a lot and don't have much time, so I'm always grabbing fast food on the go. Solution: Instead of driving through a burger place when you're hungry, be prepared - get a small cooler and pack it with healthy meals and snacks. Take some time before you have to go on the road to make your own sandwiches and bag some veggies. You can include snacks such as low fat yogurt, string cheese or fruit. Throw in a protein or meal replacement bar - the cooler will keep it from melting on hot days. Pack chilled water so you don't have to buy a soda. If you want something warm, take along a couple of thermoses - one containing soup or turkey chili and another filled with tea. If you really must grab some fast food, most places will have healthier choices - check the nutritional info for calorie and fat content. These places are all required to have the nutrition sheets on hand - ask for one. Better yet, download them from the internet so you're already prepared. Potential Disaster: I frequently eat out in restaurants and am faced with huge entree servings. Solution: Restaurant meals are completely out of proportion with real serving sizes. Don't even wait until the end of the meal - ask your waiter or waitress to bring you a Styrofoam container when they bring your food. Pack up most of it before you even start eating. If you're having a business lunch and packing a doggy bag might appear unprofessional, then don't order a whole meal. Order a healthy (not fried) appetizer, or a half sandwich, or a half salad (if they're available). Order a bowl of soup and skip the crackers. And if you do order a salad, make sure to ask for the dressing on the side - and use it very sparingly! Also be aware of what you're drinking - a large non-diet soda or lemonade will only add empty calories. Let's not even discuss the calorie content of most alcoholic beverages. Stick with water, tea or, at most, one glass of wine. 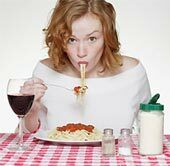 Take your time eating - put your fork down and enjoy talking with whomever you are dining with. That way you won't eat as fast. Lastly, be aware that more and more restaurants are including healthy meal choices - choose grilled or poached instead of anything with a cream or butter sauce. See if you can replace the rice or potato with an extra vegetable. And tell the waiter to take away the basket of bread. Potential Disaster: When I go to a party, I can't resist the hors d'oeuvres. Solution: Have a bowl of soup before you head off for the party. Soup is low calorie (just make sure you avoid soup made with cream) and fills you up so you won't have as much room for those tempting hors d'oeuvres. And be selective about which treats you choose - only take a single piece of your absolute favorite two or three choices and skip the rest, or stick to the veggie tray. And don't just graze mindlessly - have one piece, leave the hors d'oeuvres table and return 15 or so minutes later for another piece of something different. Another thing you might consider is bringing your own, healthy dish - just make sure it's one of your favorites, something you really love but that won't destroy your diet. And again, once you've eaten a little, leave the vicinity of the table for a while. The less you see of the food, the less likely you will be to indulge. And be just as frugal with the alcohol - not only are alcoholic beverages loaded with calories, they also stoke your appetite, so drinking gives you a double whammy. If you can pass up drinking altogether, then do so. If you don't feel festive without imbibing at least a little, then stick to one drink, preferably something made without other, high-calorie ingredients (in other words, a glass of wine or small scotch on the rocks is okay, a pina colada is not). Focus on the other festivities and don't make food the focus of the evening.